Looking into the wide open heart at its three-dimensional construction and highly original geometry, the new Art Piece Edition Historique crowns the avant-garde aesthetic approach behind numerous other creations. Combining technicity, exclusivity and the finest craftsmanship, this 33-piece limited edition (of which the first 11 are in platinum) presents a new vision of time in the spirit of the revived and renewed notion of Fine Watchmaking by Greubel Forsey. 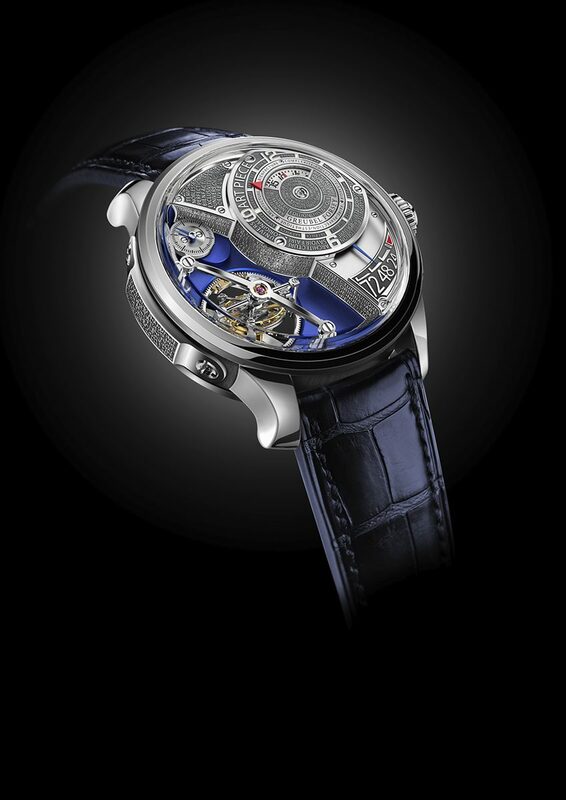 Greubel Forsey now pays tribute to the artistic and architectural approach (Opus 6, Invention Piece 1, Art Piece 1, Art Piece 2 models) with a creation that sums up and magnifies its true spirit. 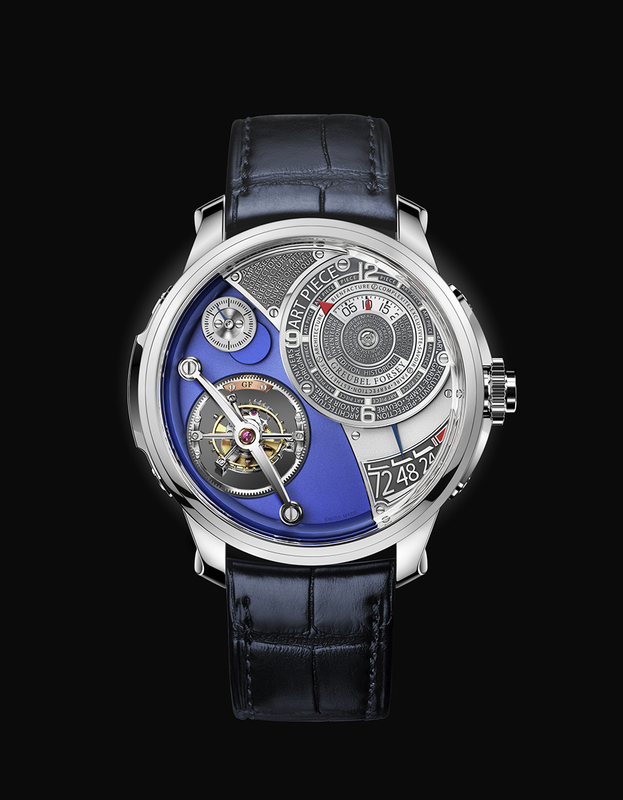 Following on from previous Art Pieces, the Art Piece Edition Historique houses within its 44 mm-diameter case a new movement with a variation on the theme of the Double Tourbillon 30°: a mechanism designed to enable the balance wheel to oscillate consistently in all planes ensuring maximum precision. The new 475-part hand-wound movement boasts a 72-hour power reserve with optimal chronometricperformance, ensured by two series-coupled fastrotating barrels. The most eye-catching aspect of all is the multilevel construction that opens up whole new vistas. The gaze is first drawn to the Double Tourbillon 30° majestically set against a royal blue background, with the flat black polished bridge and hand-bevelled and open-worked cage pillars. It is a veritable sculpture in motion, with its inner tourbillon inclined at a 30° angle performing one rotation per minute and its outer tourbillon completing a revolution in four minutes. The small seconds dial is positioned on the same level, between 10 and 11 o’clock. Lifted onto a significantly higher plane, the power-reserve indication bears large Arabic numerals and a blued steel hand. Higher still, at 2 o’clock, the offset hours/minutes subdial has been replaced with a daring titanium dome featuring a hand-punched background entirely engraved with the finely polished Greubel Forsey key values. 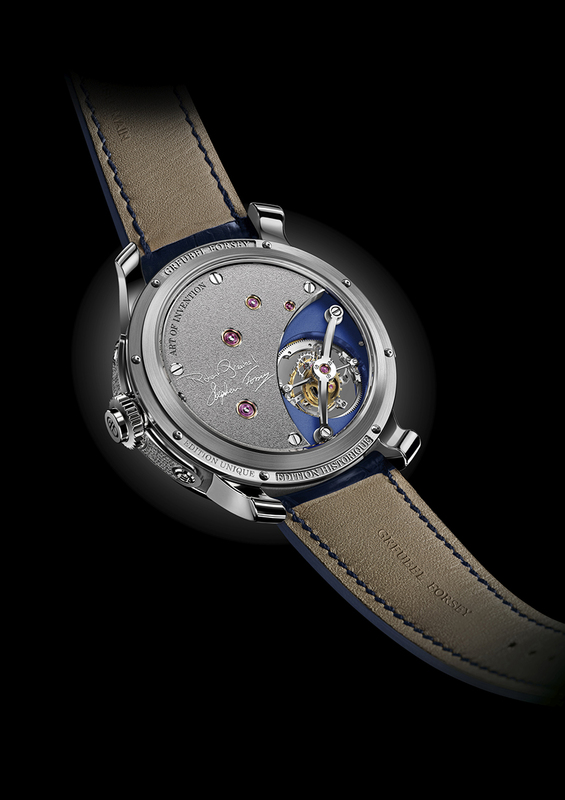 The caseback also offers an original design, a rear view of the Double Tourbillon 30° surrounded by the barrel bridge where one can admire the jewels in gold chatons and the hand-polished countersinks, completed by the relief-engraved signatures of Robert Greubel and Stephen Forsey.